Jean Rebecca is the co-founder of Kanpe Haiti and was born in a small village located in the city of Croix-des-Bouquet, Haiti. This is the genesis of Kanpe Haiti. This is where it all began. Jean came into this world in the most unusual way fathomable. After being pregnant for 11 months, Jean’s mother went to the bathroom in the middle of the night. And that was when Jean was born in a bucket. As a very young child Jean was forced to eat paper and dirt just to avoid starving to death. At the age of 6, Jean migrated to the United States. Not knowing the language or the American culture, Jean was subjected to constant bullying; just for being different. Jean was raised in Palm Beach, Florida from the time he was six. Outside of school, he self taught himself how to speak English by watching cartoons and shows like Sesame Street and Reading Rainbow. With his mother in Haiti, Jean grew up with a dad who would constantly berate him and physically abuse him. He lived in a home and neighborhood where drug use, trafficking and prostitution were commonplace. His family in the states were poor, as well, forcing Jean on occasion to wash and wear the same clothes to school every day. He would stay in school for as long as he could; out of fear of going home to fight off the inevitable hunger he would be facing. Despite all of this, Jean was the first in his family to graduate high school, college and earn a master’s degree. All with very little family support. Jean met his wife, Sylvia, in the tenth grade and they have been together since 1996. 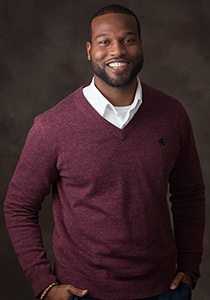 He graduated from Southeastern University in 2004 with a bachelor’s degree in Pastoral Leadership and a masters degree in Ministerial Leadership. Jean and Sylvia moved to Charleston, South Carolina in 2007. He is also an assistant pastor at North Palm Community Church. He has worked in the education field for over twelve years. He currently works for Communities In Schools as a Student Support Specialist and Site Coordinator at a local High school in Charleston. In his spare time, Jean enjoys working out, playing basketball, working on building projects and building awareness throughout his community. Overall, Jean Rebecca considers himself a simple soul whose goal is to play a role in repairing a broken world. He believes that his survival and triumph came from a collaborative effort, combined with strong love, and timely and resourceful support. Thus his vision and plan for the communities in Haiti will come from the same support that rescued him. And the support that Jean has received is what he tries to provide to others in his everyday living. Through a collaborative effort, motivated by authentic and unconditional love, Jean truly believes a better path and a greater future can become a reality for the people of Haiti. He encourages everyone to serve so that we all may play our part to help repair a broken world.